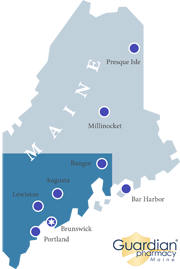 Guardian Pharmacy of Maine provides a full range of services to residential facilities in Maine from the Greater Bangor Area to the Maine/ New Hampshire border. We provide a range of medical products to residents in assisted living facilities, residential facilities where residents require assistance with daily living but do not require skilled nursing services. Every quarter our pharmacists review individual charts, conduct med pass observations and review narcotic documentation (and/or assist with destruction). And, quarterly a pharmacy technician provides additional onsite support when he/ she reviews medication inventories to ensure medications are current, expired products have been removed, and all medications are properly labeled. The focus of quarterly onsite pharmacy support is patient safety, and quarterly onsite services comply with or exceed all state and federal regulations. Residents in nursing facilities require custodial care, ongoing skilled nursing support and a wide range of medical products. Every month, our consultant pharmacists work onsite in nursing facilities where they review charts for each resident, review narcotic documentation (and/ or assist with destruction), conduct med pass observations and develop medication trend analysis/ reports for individuals and the facility. As follow up to the review and analysis, pharmacists make clinical recommendations to physicians and/ or facility nursing staff. Our pharmacists may also participate in facility committees, state pre-surveys, problem-solving situations and system development. And quarterly, a pharmacy technician provides additional onsite support when he/she reviews medication inventories to ensure medications are current, expired products have been removed, and all medications are properly labeled. The focus of monthly onsite pharmacy support is patient safety, and onsite consultant services comply with or exceed all state and federal regulations. We use state-of-the-art barcode technology and computerized workflow tracking to assure timely and accurate medication dispensing and superior customer service. When paper is removed from the pharmacy, pharmacy and facility staff can be more productive. For example, a thumbnail confirmation fax is sent to facility nursing staff each time we receive an order. We utilize multiple eMAR interface products to allow facility staff to electronically submit medication refill requests, increase productivity in their facility and facilitate accurate, timely medication dispensing. FrameworkLink is our most recent technology offering in our pharmacy system. It provides facility staff with a secure link to a Web portal where they are able to refill prescriptions, print medical records, and complete leave of absence and destruction documentation. FrameworkLink also allows facility staff to track and receive orders electronically, a time-saving option for your patient care staff. Our HME specialists assist facility staff when surgical dressings, compression stockings, ostomy, urological, nebulizer and incontinence supplies are prescribed for a resident. If we do not provide the required medical product, our HME specialists refer facility staff to a nearby vendor. We understand accurate billing is a major component of our customer service. Our billing specialists are highly trained in all aspects of insurance and Medicare claims processing. They work to maximize the benefits residents receive from their prescription insurance coverage and to provide prompt, courteous, friendly and informative support to facility representatives, to residents and to the families of residents. They are available in our pharmacy to resolve billing questions weekdays from 9AM – 5 PM. We combine the spirit of a local pharmacy with the technology and resources of a national healthcare organization to support the unique business objectives of each facility, large or small. To assist facility staff meet constantly changing technology requirements, medication delivery systems and state and federal regulations, our pharmacy representatives provide onsite customized professional development programs and in-services. Our pharmacy staff is a resource residential care facilities can utilize to keep abreast of changes and to maintain the highest level of care for their residents. We are the only long term care pharmacy in Maine with our own delivery staff, and our employees make timely deliveries to residential facilities 7days/week; 365 days/year. Each scheduled delivery includes consolidated delivery sheets with resident name, medications delivered and quantities delivered. Our delivery services are an important part of our overall quality of service, and our Management Team is convinced employing our own delivery staff sets us apart in the market.